Bay Tree Publishing, 9780983617938, 336pp. In August, 1990, a solitary, unmarried man received a phone call from a stranger who informed him that he was the father of an eleven-year-old child who wanted to meet him. The girl's name was Melissa. She lived with her mother, a housekeeper, in a small town in western Costa Rica. Melissa had the incurable disease known as cystic fibrosis. 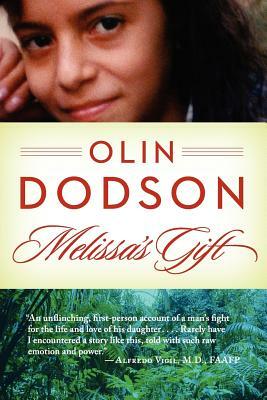 Thus begins Melissa's Gift, Olin Dodson's account of his extraordinary relationship with his daughter. Written with elegance, beauty and power, Melissa's Gift is an unforgettable story and a deeply moving reading experience. "This poignant memoir recount's Dodson's relationship with Melissa] and his anguish as her battle with cystic fibrosis threatens to take her away too soon. Dodson's writing flows with the raw joy and terror every father must experience in caring for his child, but parents and non-parents alike will find themselves swept up in this non-fiction tale." Ashley Biggers, New Mexico Magazine, June, 2012 "His tender and compelling story is an inspiring revelation of the power of love." Robert Woltman, Albuquerque Journal, April 8, 2012 "Tender, potent and beautifully written ... I loved this story." Joan Schweighardt, author of Gudrun's Tapestry "A thrilling, thought-provoking roller-coaster ride." Isabel Stenzel Byrnes, co-author of The Power of Two. Olin Dodson has been a licensed psychotherapist since 1986. He holds Master's Degrees from San Francisco Theological Seminary and Sonoma State University and currently provides consultation in the field of addiction treatment. He also teaches workshops on Grief and Resiliency and offers public presentations on Melissa's Gift. He is recipient of the Dr. William Krieger Founders Award, New Mexico Mental Health Counselors Association and The President's Award, New Mexico Counseling Association.